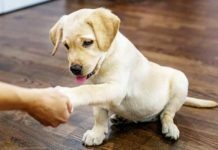 Dog training leads are invaluable tools for any dog owner, but are especially useful for training bouncy and friendly young Labs! 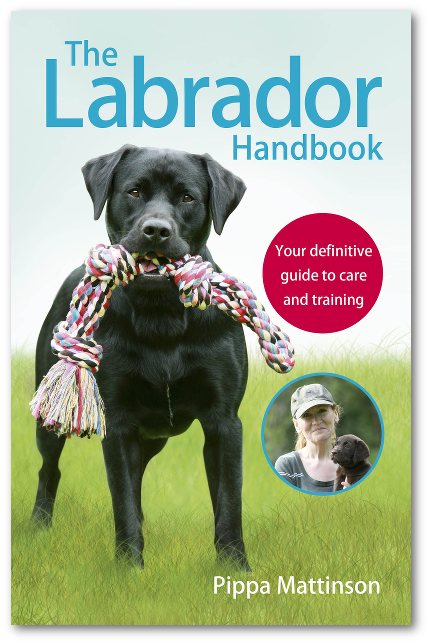 Professional dog trainer Jo Laurens describes exactly how a long dog leash works and shows you how to get the best from yours. A long-line is a long dog training leash, with a regular clip fastener at one end. 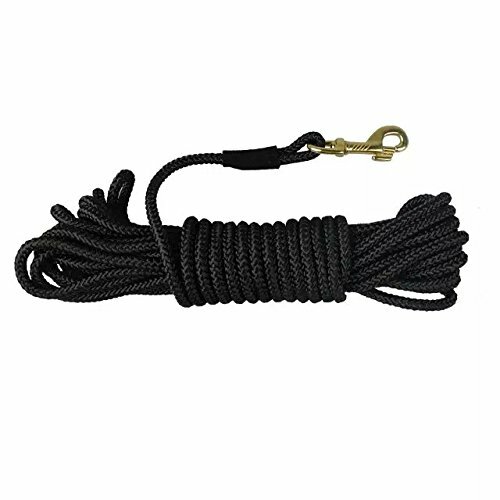 [wp_ad_camp_5]We need to differentiate a ‘long-line’ from a similar piece of equipment it is often confused with: A long-line is not an extending leash – the type of leash which goes in and out of a box. A long dog training leash or long-line is always the same length and does not automatically lengthen and shorten. In the US, these long dog leads are often called ‘check cords’. This term sounds similar to ‘check chain/choke chain’, and that can cause some confusion. A check cord is not a check chain/choke chain. It is just another word for a long-line. What are long dog training leads used for? It does this by preventing the dog helping itself to all kinds of rewarding behaviors (such as ignoring your whistle and chasing butterflies instead) without your permission. 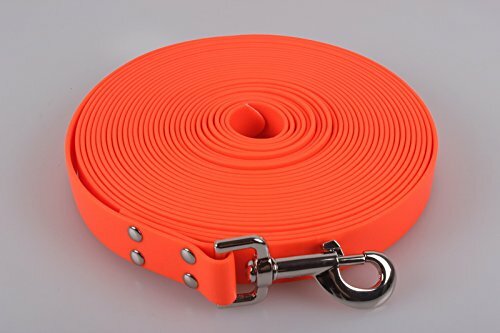 What length dog training lead should I buy? What is the best length of long-line? This depends on what you plan on using the long-line for (more on that, below!). I’d recommend a 10m long-line. Any shorter and your dog can’t get far enough away from you. Any longer and the line becomes unwieldy to manage. Then I recommend a 5m long-line. For these purposes, you want to be able to hold the whole leash in your hands, letting it out and taking it in as needed by the dog. Any shorter and your dog can’t move around freely enough. Any longer and you won’t be able to hold it all. What is the best material for a long-line? Again, this depends on what you plan to do with it. I’d recommend a biothane long-line. This is a rubbery, waterproof material. It does not absorb water, like a nylon training lead. Mud falls off it. It does not get smelly if left in a bag or the car. As it has no fabric to snag, it catches less on twigs and branches and tends to trail behind the dog better. or these lines Alternatively, a fabric long-line like this one – order the shorter length. The line won’t be trailing on the floor to absorb water or to get caught, and you will be able to communicate and stay in touch with your dog better on a fabric long-line instead of a dense biothane line. Always use a harness when you are using a long-line. Harnesses are preferable anyway to collars even with short leads attached. 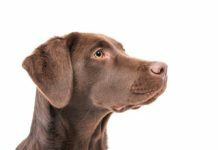 But with long dog training leads, you can really do serious damage to a dog’s neck if the dog runs full pelt for many metres before being stopped suddenly when the long-line is attached to a collar. If your harness has two points of attachment (chest and back), you should preferably clip your long lead to the back attachment. This way, it will flow off the back of the dog and is less likely to get tangled up in legs and belly. Very occasionally – with extremely strong, powerful dogs – some owners feel they need to attach a long dog leash to the chest attachment for control. This is ok if necessary, but be aware that it is less ideal and may impede legs and rub on the dog’s belly or thighs if allowed to trail underneath. How do I use a long-line for recalls and training? The long-line needs to stay on the dog until you are almost never touching it and it’s redundant. It needs to feel, to the dog, as if it’s part of the dog’s anatomy – taken for granted and ignored. If you sometimes leave the long-line off the dog, the dog will be able to ignore you and access fantastic rewards in the environment at those times. Meanwhile, when she is wearing it, she will not be able to do this. The dog will therefore learn the ‘meaning’ of the long dog-leash, and become long-line ‘wise’. You will end up with a dog which responds brilliantly when wearing the long-line, but any time you remove it, she will know that she is free and able to ignore you. To avoid the dog learning this, use it 100% of the time so the dog can’t compare ‘long-line on’, with ‘long-line off’. Don’t hold on to the training lead! Try not to hold the end of the long-line, even if it has a handle. Allow the dog to trail it on the ground. If your dog is used to ranging further than the length of the line, you may need to hold the line to begin with. As the dog approaches the end, recall her. If you repeat this every time she nears the end of the line, she will learn to hang out nearer to you – you will re-program her default range. Then you will be able to drop the line on the ground. 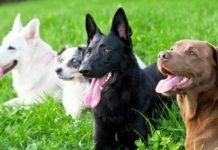 If you are moving through an area which may have game, other dogs, or higher distractions, you may want to take hold of the line as a precaution. 1. Take amazingly tasty recall treats out with you, on your walks. This includes things like pate, sardines, mackerel, black pudding, gourmet wet dog food – soft wet foods, work best. You can feed these using a plastic toddler spoon. [wp_ad_camp_2]Call the dog back many times on a walk, give a tasty treat and release the dog to ‘go play’ again. Some dogs prefer toys to food. 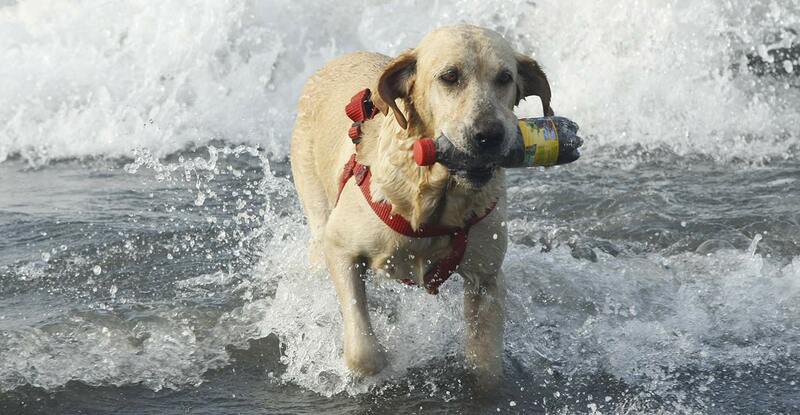 If you have a dog like this, have a few ‘special’ toys which you only use for recalls. 2. If the dog ignores you, quickly pick up the dog training leash and gently remove the dog from the distraction. Every second the dog ignores you, she is self-rewarding through whatever she is doing – and self-rewarding for ignoring the recall. So a speedy response with the long-line is important. 3. Once you’ve removed the dog from the distraction, usually dogs readily come back to the handler. Reinforce this with a treat. If the dog doesn’t come back, make a smoochy noise, crouch down and run your hand through the grass or try to be exciting! Just like with stabilisers on a bike, using a long-line is a halfway house – a process – not an end-goal. Just as no one wants to be an adult, still cycling with stabilisers, no one wants to have a dog which – five years later – still has a long-line on. When you don’t need the long-line for a week, and can successfully call the dog back from any distractions, then you no longer need to use it. How do I use a long-line to work with a reactive dog? The main purpose of long dog training leads, when working with a reactive dog, is to enable the dog to feel more free than they feel on a short lead. 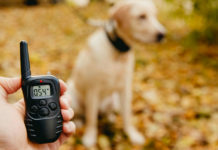 We know that reactivity, aggression, fear and frustration are all worse when a dog feels ‘trapped’ on a short lead, in the presence of a trigger. This is why many owners of reactive dogs report that reactivity is much worse on a (short) leash, compared to off-leash. Yet a reactive dog can’t be allowed off-leash, for safety reasons. But we can use a long dog leash to help the dog feel unrestricted and also to allow for a bit more exercise and mental stimulation – whilst also keeping safely hold of the dog. Safety is very important and long dog leads can be hazardous if not used correctly with reactive dogs. They have the potential to cause you to trip, or for you or your dog to get tangled up at critical moments. (When a trigger appears and your dog lunges!). This could result in losing control of your dog. 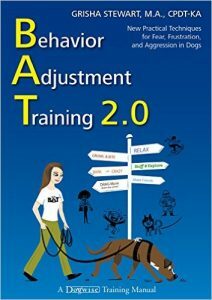 For this reason, Behaviour Adjustment Training (BAT) has a series of Leash Skills which teach the handlers of reactive dogs how to safely use long dog training leads around triggers. When using BAT Leash Skills, the handler of a reactive dog will hold the entire (5m) dog training leash in their hands – with no leash trailing on the ground to present a safety risk. The handler will let out and take in the leash, as the dog moves, to give the dog the sense of being off-leash. 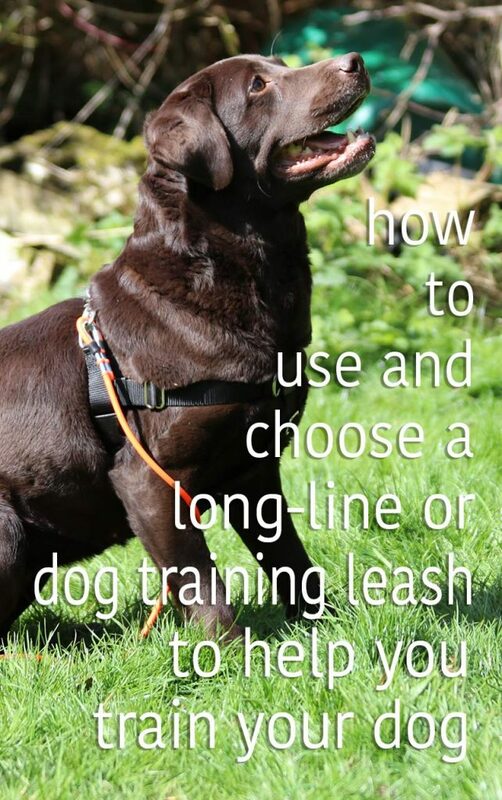 It’s important not to confuse the long-line or training leash with the extending lead. With some exceptions, one of the key principles of long-line training is that for much of the time it is allowed to trail on the ground, not held in your hand. Extending leads are not suitable for this purpose. 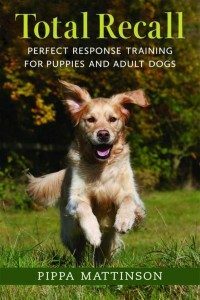 Dog training leads are also important tools for anyone working with a reactive dog. Biothane lines are great for basic training purposes. If you are using a long line with a reactive dog a fabric line may be more appropriate. Don’t forget to attach your dog training lead to a well fitting harness. Hello, I’m on Exercise 3, page 100 of Total Recall working with Toffee, my 7month old Border Collie clan. He’s loving the juicy meats – but he’s now getting obsessed with me, virtually touching me as much as he can! Plus, he’s become very aware of me eating whereas previously he hasn’t bothered when we’re at the table. I don’t want to exclude him if poss, but also want to enjoy meals/snacks without the puppy eyes, slobber and whimpers!! 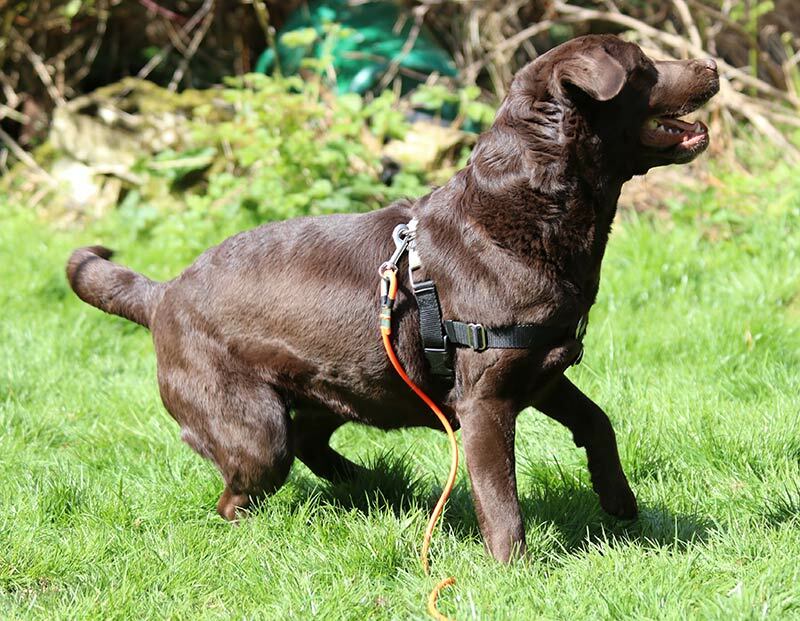 I have been using the long lead(10 metre) for sometime now because Rufio, my choc labrador(not castrated) had been attacked few times and eventually bitten,and also had been off training in the vital months becaus of elbow operation. He is 2 now but at the time lost the recall and was attacking other dogs passying by(never happened before he was attacked) making a normal walk a nightmare! With the help of a trainer/behaviourist we are now back on track withe recall that is getting fantastic and much better with other dogs approaching. I have now started to use the 5 metre lead(instead of cutting the other that we find useful in different occasions) and as you say in both case have been leaving trailing on the ground(thanks for the advice about gloves!Had few thorns in my hands!) after he got better in obedience. I will soon hopefully go on the shorter lead and eventually nothing but am still concerned about other dogs encounters:if they should be too close not sure if he will come back or avoid a fight…how do you prepare for that? !The trainer tells me I could start leaving him maybe now for short periods and if no other dogs to be seen as his recall is so good…but I have never tried with other dog in the near proximity…Perseverance will be probably best for me to regian confidence. But the long leads and the squicky ball have saved our lives!And especially our walks!excellent system! Hi Pippa, thank you so much for this! I will definitely look into it. Sorry for my late answer but was away and no internet!Looking forward to get your book as well! 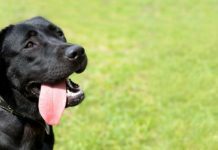 Still struggling with other dog’s encounter but hope this article will help!